Get off the sidelines and behind the wheel of a world class champion supercar! 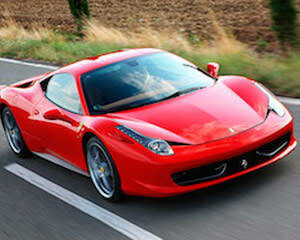 Why just watch when you can experience the adrenaline pumping action yourself on this Ferrari 3 lap drive? Since its inception, Ferrari has dominated the racing scene with its dedication to combining speed and precision and the 458 Italia is a perfect example of their success! With a 4.5L V8 nearly 570hp engine, the Italia is the perfect mix of precision handling and aggressive speed. Hitting top speeds over 200mph, this car guarantees satisfaction to the speed demon in everyone. But at the Arizona Motorsports Park, you’ll have the chance to do more than just put the pedal to the metal. With 1.3 miles of asphalt and 9 heart-stopping turns on the west track, the AMP gives drivers of all levels the opportunity to test their skills at handling a machine of this caliber. After a brief instructional session to familiarize you with your dream car, driving techniques, and the particulars of the track, you’ll hit the pavement for 3 laps of power and speed!